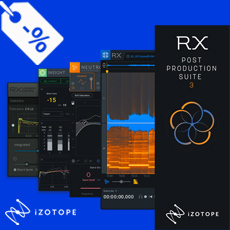 RX Post Production Suite 3 is the flagship of the RX line and features four of iZotope’s most powerful tools for audio post production: RX 7 Advanced, Insight 2, Neutron 2 Advanced, and RX Loudness Control. This comprehensive audio post production suite features intelligent and powerful software solutions for everything from dialogue editing to mixing and delivery, plus bonus content. Neutron 2 Advanced: Achieve a clear, wellbalanced mix with innovative new mixing and analysis tools and inter-plugin communication with Insight 2's new Intelligibility Meter.